In the seventies a package holiday to Spain (Mallorca) was still fairly exotic and the picture illustrates images of that country that many of us held. As girls we coveted and collected flamenco dolls which were brought back as souvenirs by friends and relatives. Their colourful tiered skirts and dark features were incredibly exciting. This is another 1974 card from an old friend wishing me well in my new school. I am sorry to say that I have no recollection of Tracey; this may be the only communication I had from her. 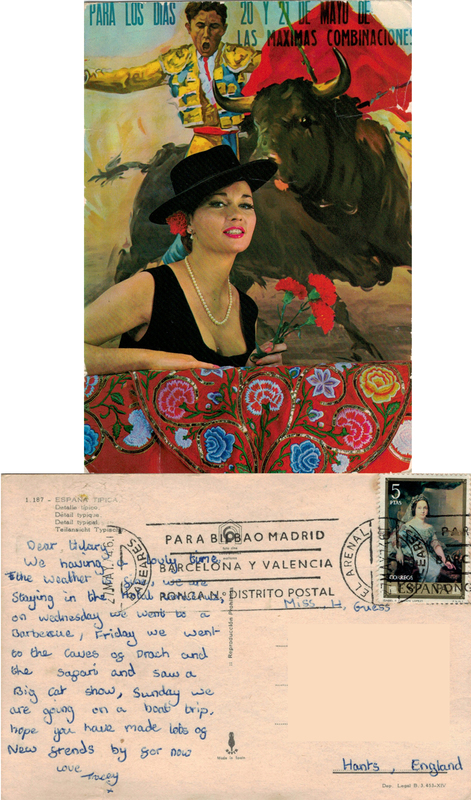 This entry was posted in Deltiology, Memorabilia, Nostalgia and tagged flamenco, friends, history, holiday, Mallorca, Nostalgia, postcard, postcards, Spain, spelling. Bookmark the permalink. A big cat show. How exciting. Once again, that cliffhanger in italics at the end just does something to me! You make the reader thirsty for more somehow. There’s a mystery in there. Thank you – yes, what was known is now unknown, maybe it will be re-known? Who knows!